It is a 100W Charger/Adapter/Power Supply Module, Input Voltage: DC 5.5~28V (input voltage must be 2.. The DC buck converter, waterproof, overvoltage and overcurrent, input voltage range DC12V/24V (wide .. It is high-quality DC12V/24V to 7.5V 10A Buck Step-Down Converter ,conversion efficiency up to 90%,C.. 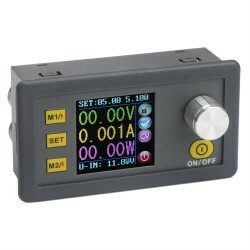 It is a Power Supply Module/Adapter/Charger/Power Converter, Input Voltage: DC 4~30V (limit 36V), Ou.. It is a 10W Power Supply Module/Car Converter/Power Adapter, Input voltage : DC 9~60V, Output voltag.. It is a 11W Power Supply Module/Car Converter/Power Adapter, Input voltage : DC 9~60V, Output voltag.. It is a 120W Buck Converter/Power Supply Module/Car Adapter, Input voltage: DC 24V (DC 17 ~ 40V), Ou.. It's a Waterproof DC Buck Converter/Power Supply Module/Car Adapter,Input voltage: DC48V (wide volta.. It is a 120W Car Adapter/Power Supply Module/Voltage Regulator, Input Voltage: DC 60V(20V~72V), Outp.. The Waterproof DC Buck Converter, it is definitely a very high cost products, voltage range 17-35V .. It is high-quality DC 10V-35V to 9V 10A Buck Step-Down Converter ,conversion efficiency up to 90%,Ca..